Three Vintage Noiseless pickups offer all the clarity and articulation you’ve come to expect from Strat pickups with no hum. A six-position V6 switch disguised as a tone control and preamp offers 6 extra tonal variations, without compromising the classic, slick look of a Strat. An S-1 switch concealed in the volume control bypasses the preamp for rich, traditional pickup-only sounds. Enjoy smoother travel when using the tremolo bridge, thanks to the modern two-point synchronized design, which includes bent steel saddles for classic aesthetics. A contoured neck heel and 4-bolt asymmetrical neck plate make it easy to comfortably reach the upper registers of the neck. The flatter 12"-radius fingerboard makes it easy to play fast leads and perform deep bends without fretting out. Locking tuning machines provide enhanced tuning stability, along with quicker string changes. The alder body bears a highly durable gloss polyurethane finish that will easily stand up to hard playing, keeping the instrument like new for years to come. Classic aesthetic touches include nickel/chrome hardware and a three-ply mint green pickguard, along with aged white pickup covers, control knobs and switch tip. 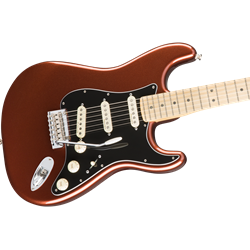 Fusing a near-infinite variety of useful sounds with classic Fender style and upgraded modern components, the Deluxe Roadhouse Strat is the guitar for guitarists who want more from their instrument, at an affordable price.